"The object of this invention is to provide a prism-plate that has a large illuminating capacity and that is capable of diffusing a large volume of light next, adjacent and in close proximity to the plate, as well as over a great distance from the inner or light-diffusing side of the plate." Nobody believes what prism glass can do to make dark rooms light till he sees a test. Come in and learn. 1870|1872 Founded by E. W. Palmer and George H. Kingsley [b.1839 d.1902]. 1891 130, 132 & 134 Champlain St.
27-Aug-1914 "CERTIFICATE OF CONTINUED EXISTENCE" filed with the Secretary of State for The Cleveland Window Glass Co. Huh? 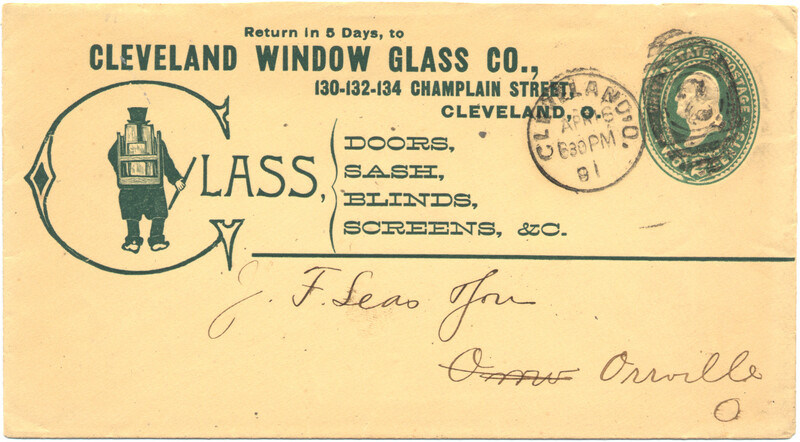 "CLEVELAND WINDOW GLASS COMPANY, Office and Salesroom, 130, 132 and 134 Champlain Street. The Cleveland Window Glass Company was started in 1872 by E. W. Palmer, who has been dealing extensively in glass for more than thirty years, and George H. Kingsley. Office and salesroom, 130, 132 and 134 Champlain street, in a brick building 60 by 80 feet. Carry an extensive and varied stock of French and American window glass, German mirror plates, car, coach, picture, floor, roofing, ornamental and polished plate glass. Most extensive glass house in the city, if not in the State. Sales about $80,000 per year. They employ ten men. They are sole agents for Cleveland for the American plate glass, made in New Albany and Jeffersonville, Ind. For more than a century we have been paying Europe exhorbitant prices for manufactured plate glass, and the belief was prevalent that it was impracticable to manufacture in this country, but in six years it has been demonstrated that it can be made of such quality and at such prices as will command the market. Another proof that America can be self-supporting. This success has required earnest struggle in the face of previous hostile attempts which had failed and millions of money lost, caused, it is said, by powerful, hostile combinations, representing the capital of the Old World monopolies. 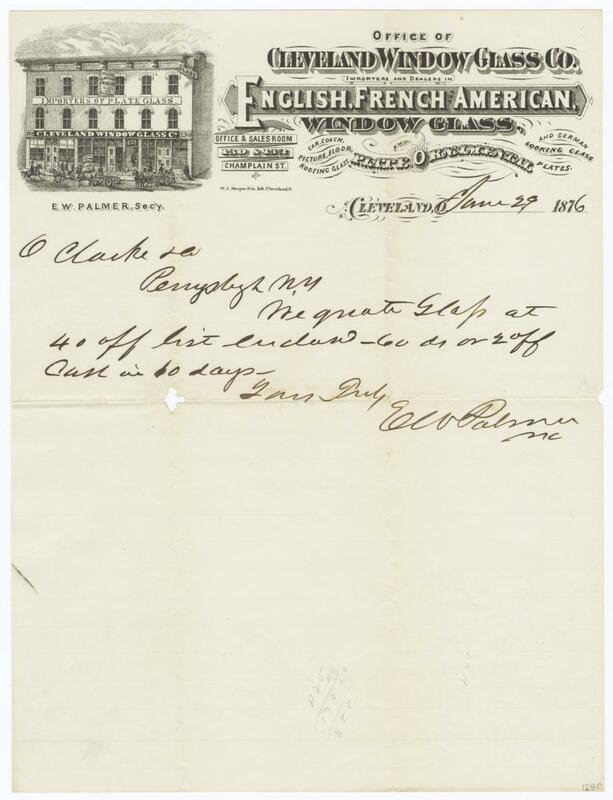 Fortunately for this country the enterprise at New Albany, the first successful one, was controlled by a man of large means, who, for nearly five years fought the battle for America with unyielding effort, during which time foreign competition reduced the price more than 50 per cent. (gold value). Through all of which it has completely triumphed." Cleveland Window-Glass Company, Importers and Dealers in English, French, and American Window-Glass, Plate, and Ornamental, Office and Salesroom, Nos. 130 to 134 Champlain and Nos. 73 and 75 Michigan Streets; E. W. Palmer, President and Treasurer.—A review of the importing houses of Cleveland discloses a remarkable degree of activity in all departments of trade. In no branch of business, however, has a greater amount of energy and ability been manifested than in the importation of foreign glass. A representative and progressive house engaged in this trade is that of the Cleveland Window-Glass Company, importers and dealers in English, French, and American window-glass, whose office and salesrooms are located at Nos. 130 to 134 Champlain and Nos. 73 to 75 Michigan streets. The Cleveland Window-Glass Company was established in 1870, and was duly incorporated under the laws of Ohio in 1880 with a capital of $50,000. The following gentlemen, who are greatly respected in commercial life for their sound business principles and honorable methods of transacting business, are the officers, viz. : E. W. Palmer, president and treasurer; Levi Buttles, vice-president; E. W. Palmer, Jr., secretary; W. K. Palmer, superintendent; B. F. Wade, assistant treasurer. The premises occupied are extensive, and are admirably equipped with every facility and appliance for the accommodation of the large and valuable stock of glass, which is the best in Northern Ohio. The facilities of the company for promptly supplying all sizes of American and foreign window-glass are unexcelled. They keep constantly on hand foreign and American plate, ornamental, cathedral, floor, and roofing glass, and have superior facilities for cutting and beveling on their premises. The company likewise carry a large stock of glazed windows and blinds, and are agents for Hartman's patent sliding inside blinds, which have been recently introduced into Cleveland by this respectable house. They have an extensive planing-mill of their own, and manufacture blinds of a superior quality and workmanship. Their patent outside blinds are unsurpassed, the slats work freely, tenon will not break or rot, and staples do not pull out. These qualities and several minor improvements and the best of materials and workmanship combine to make the neatest and most desirable outside blinds yet offered to the public. The trade of the Cleveland Window-Glass Company extends all over the Middle and part of the Eastern States, and is constantly increasing in volume, owing to the superiority and quality of its glass and other specialties. The policy upon which the business is conducted is characterized by liberality and the careful fostering of the interests of all patrons, so that transactions once begun with this house may be made not only pleasant for the time being, but of such nature that they shall become profitable and permanent." ONE LIFE LOST, SIX PERSONS INJURED—THE LOSS WILL REACH $250,000. Cleveland, Ohio, Oct. 28.—Two fires, which occurred to-day within an hour in the heart of the city, caused a property loss of at least $250,000, the loss of one life, and the serious injury of half a dozen persons. Shortly before 11 o'clock an alarm called the Fire Department to the works of the Cleveland Window Glass Company, on Champlain Street, between Seneca and Ontario Streets. The three-story brick building was filled with smoke and the employees, both male and female, were rushing down the stairways. The fire was quickly extinguished, and a search of the upper floors was made to learn if all the employees had escaped. At the head of the stairway Michael Sullivan and Kittie Nolan were found insensible. They had been suffocated by the smoke and had fallen close together. They were carried down to the street, and Miss Nolan died an hour later. Sullivan will recover. The loss by fire to the window glass company was $1,000, but the damage by water is estimated at $15,000; fully insured. Before this fire had been extinguished another alarm was sounded calling the department to the big sash and blind factory of A. Teachout & Co., fronting on Michigan Street 42 to 46, and extending back to Canal Street 300 feet. The fire started in the warehouse, and before the firemen reached the scene the flames had spread to two other buildings connected with the warehouse by bridges, and the fire was beyond control. 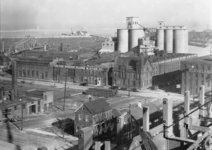 Soon after the firemen began work an explosion occurred in the paint room, which blew the Michigan Street front of the building across the street. A number of persons were standing on the sidewalk, and the firemen were playing on the front. Col. C. C. Dewstoe was thrown backward by the explosion, and Harvey C. Beeson of Detroit was blown clear across the street and badly hurt. Fireman Charles Weiler was badly injured internally, Fireman John J. Kelly was badly cut, and Fireman Michael Maloney received severe bruises in the side and chest. After the explosion the fire spread to the four-story brick building of M. Mittleberger & Son, dealers in hides, adjoining, which was partially destroyed. L. C. Beardsley's tin-can works and Wood Brothers' tile works were also destroyed. The loss of A. Teachout & Co. is total and will reach $200,000, insurance about $100,000; Mittleberger & Son's loss, $20,000, insurance $15,000; Wood Brothers' loss, $8,000, insurance $7,000; L. C. Beardsley's loss, $500, insured. A strong wind was blowing at the time of the fire, and great clouds of sparks were carried over the business streets. Your experience as a practical advertiser may be wide. You are certain to have had wide experience of advertising from the common standpoint of a reader of advertising. Have you ever known or heard of an advertiser using plain pica old style paragraphs who was a fool? This sort of type and that sort of men seldom go together. "They think it is up in Cleveland," Mr. Palmer protested. "It's talked about, and commented upon, and it brings results." "But it isn't first class advertising." "Well, in the first place you're using too much space and spending too much money—more money than your business can afford. Then, you can't keep up the pace—that much cleverness every day will drain your energies, and the ads will begin to drag upon you by and by. You ought to stop, get a little single column ad in preferred position, use small type, one kind of type, tell some little thing about the business every day, and tell it in such a way that everybody'll be interested." The old man probably mends more windows than anybody else in America. That's because he takes such care of his customers. Autumn is the best painting season. Paint is apt to wear better when it is applied when the temperature is uniform—neither too hot nor too cold. Nothing to say about linseed oil except that the price is right. We hear when the price goes up, and sometimes when it goes down we hear that too. Would you like to see some of the beautiful doors our mill is turning out? We're not trying to do hardwood cheaply. There's no fun in cheap hardwood for anybody. Busy at keeping out the cold these days. Doors, windows, storm-sash, reglazing—it's all in our line. Fall storms coming. The patching-up-window season is here. The old man is ready. Telephone size and color putty. The ironwork of skylights should be painted in these days of sun and rain. We can keep them in repair either before or after they leak, as you prefer. We're not after the cheap trade in hardwood work. It costs time and money and care to make it, and these must be paid for. Stock work costs little to handle and we charge accordingly. Let every factory man read this: There is money for you in water paint—us, too. You think prism glass is a luxury. 'Tis indeed, if you're working or living in a dark room. Better order storm sash in time. Remember the price of coal. We are extremely careful of what we advise you to buy. The world is full of humbug stuff—the fuller yet of faulty stuff. Sun and rain are hard on skylights. Better let the old man look after them while he's fixing up your windows. The little "old man" trademark is unique. Mr. Palmer deliberately say down to evolve a trademark and had difficulty in finding anything that would typify the company's commodities. Finally he remembered the Russian Jew who, landing in this country without a trade, takes to mending broken windows. The little figure lends itself to silhouette, and is never tiresome. Hardly any other bit of advertising is so well known in Cleveland as the "old man," and he is made a sort of guide, philosopher and friend to the public. All Cleveland papers are used impartially, and the daily ad is quiet, truthful and interesting. People read it as they read the Rogers-Peet ads—because each contains some sort of well-filed point and perhaps a bit of information that it will not do to miss. Mr. Palmer not only aims to tell the truth in his ads, but tries to make it look like the truth. And he has succeeded. Once establish a good business name and it is better, far, than great riches. What man in his senses ever doubts a statement made in a Rogers-Peet ad—or even questions one? German papers are used in Cleveland, but the ad is printed in English. Mr. Palmer believes that everyone worth going after reads English, and the ad is a novelty, being the only English announcement printed in those mediums. The principle upon which this advertising is placed is odd. The chief object is to reach large buyers of the firm's commodities—builders, architects, retailers. The small householder who buys a few panes of glass and a can of paint every year is an important but secondary factor in the company's business. By talking generally to the mass of people the company talks to all. The big buyers read the daily papers as carefully as little ones, while the small householder is likely to build a block of stores some time. Traveling men who come in and out of the city spread the firm's name and advertising. Mr. Palmer counts largely upon transients who are attracted to the advertising during brief visits to Cleveland. Plain old style is a sort of trademark with the firm, and figures on everything from booklets to letter heads. Booklets are sent out to classified lists of dealers, as well as circulars and other matter. Two very pithy booklets on prism glass and Lucol, which is a substitute for linseed oil, were lately prepared for the firm by Mr. Powers. Car cards are also used in Cleveland, as well as blotters and like accessories. "In '96 I first met Cleveland Window Glass Company, Cleveland, O.—jobber of glass, housebuilders' woodwork and paint—and found the best client I have, or ever had; capital $50,000 then; $160,000 now; and will be, I venture to guess, at New Year's, $200,000. Besides the Company owns some other handsome interests. 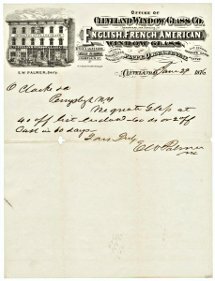 E. W. Palmer, manager, had good judgment; was diligent, cautious, eager to learn, ready to pay for help that would bring him immediate profit, and not too conceited to learn from a specialist. Mr. Palmer is justly esteemed the foremost advertiser of all that region; and yet he has never charged so much as $10,000 a year to advertising account. His advertising is true; it is true in detail, and the spirit of it is true; one sees that it is true in reading it. That is its power; his power. He is a powerful man in Ohio. I reckon him my best client, because he, better than anyone else, illustrates my business philosophy. There are plenty of richer men; there are men making money faster; men of greater generalship in business. I know of no other man so true and so sure in business, who shows himself true and sure by his business plan and print, who gets on by being and showing himself so true and sure in his plan and print." Organized bands of vandals, armed with slingshots, are believed to be responsible for a campaign of destruction against plate glass companies in Cleveland. Small iron bolts evidently were used to destroy eleven costly window panes in various parts of the city. In each case a bolt, probably fired from a slingshot, broke a hole through the center of the window. Bolts were found inside each building the vandals visited. Police are trying to solve the mystery surrounding the motive for the acts. They are searching for the vandals following an appeal for protection made to Chief Rowe by glass manufacturers The latter are incensed over the acts of violence and fear the wreckers may go to even greater lengths. James T. Tanyan, general manager of the Pittsburgh Plate Glass Company asked the committee on labor disputes of the Chamber of Commerce to start an investigation seeking to place the blame for the campaign of vandalism. Three plate glass windows were smashed on the West Prospect avenue and Champlain avenue fronts of the Cleveland Window Glass Company's building. Iron bolts had been hurled through the windows. Similar bolts were found at the other places visited. A reward of $300 has been offered for information that will lead to the arrest of the vandals by the Pittsburgh Plate Glass Co., Cleveland Window Glass Co., Toledo Plate & Window Glass Co., A. Teachout Co. and Crane Glass & Mfg. Co."
"John H. Grittner. During his early boyhood at Cleveland Mr. Grittner spent several years as an apprentice in learning the business of making mirrors. That trade has been the basis of his subsequent career, and has employed him in various companies and in various cities. He and a partner some years ago established a plant of their own, and it has been gradually developed under their efficient administration until it is now one of the important industrial assets of the city. Mr. Grittner was born at Cleveland on September 2, 1876, one of the six children of Julius and Catherine F. Grittner. His father was born in Berlin, Germany, July 3, 1847, was educated in the old country and learned the trade of patternmaker, and in 1867, at the age of twenty, came to Cleveland. Here he followed his trade until he retired in 1911. John H. Grittner spent his boyhood days attending the local schools of Cleveland until he was fourteen. At that age he was taken into the firm of J. L. Crane & Company as an apprentice to learn the mirror making trade. He was with them six years, and as a journeyman he found his first employment at Cincinnati as a mirror maker with the Western Mirror Company. Three months later he went on to Chicago, worked for Tyler & Hippach three months, spent a month in St. Louis, Missouri, and returning to Cleveland, was employed by the Forest City Mirror Company as beveler and mirror maker for three years. Then for a time he was a partner with H. F. Ehlert in the same line of business until 1902, when he sold out and took charge of the mirror department of the Cleveland Window Glass Company a year and a half. He was next for two years manager of the Whipple Art Glass Company." Unique Advertising of Cleveland Window Glass & Door Co.
Cleveland, Ohio, October 21—This is to be a story of advertising and what it can do for a company. Most paint men in this city have not yet realized what consistent advertising can do for business, but those who have, have found themselves well repaid for the discovery. Among these latter men can be classed E. W. Palmer, treasurer and advertising manager of the Cleveland Window Glass & Door Co. Mr. Palmer has been with the company forty-three years, and about thirty years ago he began to take an active interest in the advertising part of the business as he is himself an artist of considerable worth, having taught at the Cleveland School of Art, and being a member of the Arts Club. 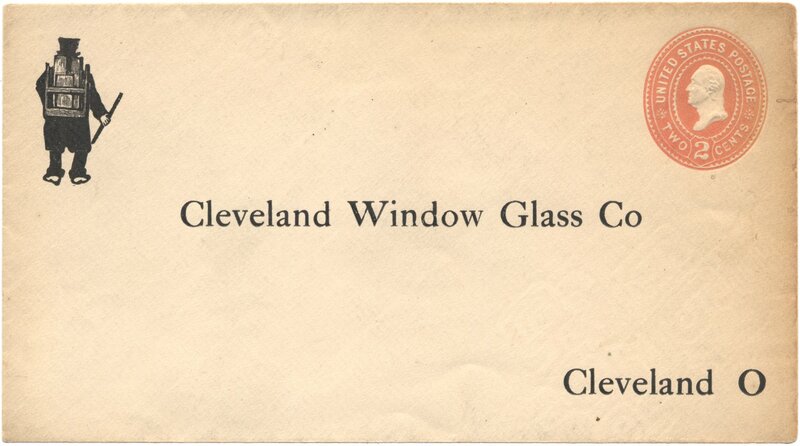 For some time Mr. Palmer endeavored to find something which could be used for all time, and which would immediately remind the public of the Cleveland Window Glass & Door Co. every time they saw it. At last he conceived an idea from an old glazier who was very familiar to Clevelanders about thirty years ago, and created an old man with a pack on his back which has been used ever since as the trade mark of the Cleveland Window Glass & Door Co.
Now Clevelanders never pick up a newspaper or enter a steet car without seeing some clever little saying accompanied by this queer little black man with the pack on his back. "About thirty years ago," says Mr. Palmer, "a solicitor for street car advertisements came to me and asked me to advertise in cars. I consented and since that time never a day has passed when a placard from our company has been missed in a single car. "This same is true of newspaper advertising. We have run an advertisement in the dailies for about twenty-five years, six days a week. We never run the same advertisement twice in a newspaper while the street car advertisements are changed every six months." The following are the little sayings which have been used furing the past year, and which are always run in connection with the little man. "Imagine a man who doesn't believe in paint!" "Many more roofs are ruined for lack of paint than because of wear." 87 telephones that we're paying for. Who says "Talk is Cheap?" "Good paint depends as much on honesty as on skill. Not at all on mystery." "Do you suppose the old viaduct stairs would be tumbling down if someone years ago hadn't economized on paint?" "Not much use in painting screens after they show rust. The time is paint is before it's needed." "It's fun to do business in a way that makes friends customers and customers friends." "If there's any paint problem of yours we can't answer, we'll thank you for the chance of looking it up." "If folks knew the value of paint, what a lot of enlarging the factories would have to do." "Carloads of Barreled Sunlight and Factory White going onto the walls of Cleveland. It's daylight and night light we're selling; more production, less eye strain." "The prosperty of a country can often be measured by its use of paint. Perhaps sending Barreled Sunlight, Vitralite and 61 Floor Finish to Russia might make history." It has come to a point now when Clevelanders enter a street car or pick up a newspaper they look for the little man in order to read the clever saying which always accompanies him. "This advertisement has been most effective in boosting the paint industry for the company," says Mr. Palmer, "and it is the oldest business advertisement in existence." There is no other paint company in the country which advertises so consistently, and the result of this is evident when it is stated that today this company has the largest mill for special work in the world, having forty and one-half acres of floor space. About $800,000 dollars a year of retail paint business is done, and each year a steady increase is noted, Mr. Palmer states, and $100,000 worth of paint is always carried in stock, and this stock must be replenished about eight times a year." "Mr. Edward W. Palmer, the founder of the Cleveland Window Glass Company, died at his home in this city Wednesday, July 8, 1896, aged about seventy-five years. Mr. Palmer was born in Granville, N.Y., in 1821 and came to Cleveland fifty-four years ago. He founded the Cleveland Window Glass Company about twenty-five years ago and continued as its president until the time of his death. He was the inventor of liquid dye, and devised many improvements in varnishes and paints. He was married to Miss Julia M. Kingsley, of Fort Edward, N.Y., in 1838, and the union resulted in five children, all of whom are living. The three sons, Warren K., Edward W., Jr., and Frederick H., occupy the positions of vice-president, treasurer and secretary of the Cleveland Window Glass Company; Mrs. Earnest Cobb resides in Philadelphia, and Miss Lucy makes her home in this city. Mrs. Palmer and her daughter were at Mr. Palmer's bedside at the time of his death. Mr. Palmer was the founder of Grace Episcopal Church, in whose interests he had been an earnest worker for fifty-one years. Mr. Palmer's business career extends over a period of almost sixty years. "Edward W. Palmer, Cleveland. Secretary and treasurer Cleveland Window Glass Co. Born Cleveland, O., Nov. 21, 1863 [sic], Educated in the public schools. Started in the present business 1870 in the glazing department. Has since been in every department. Secretary and treasurer for the last twenty years, still serving. Director and treasurer Builders Exchange 1890-1904. Member Chamber of Commerce and Builders Exchange. Member Cleveland Art club and treasurer for five years. Politically a Republican. "Frederick Herbert Palmer, Cleveland. Vice president Cleveland Window Glass Co. Born Cleveland, O., May 2, 1865. Educated in the public schools of Cleveland. 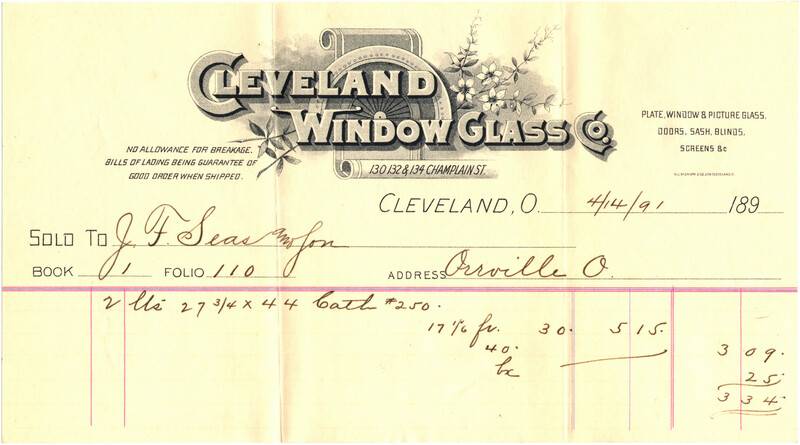 Started in the Cleveland Window Glass Co. in 1884. Elected vice president in 1895, still serving. One of the organizers and former president The Cleveland Business Men's Convention League. Member Cleveland Chamber of Commerce and Builders Exchange. Politically a Republican and a member of the Episcopal church.